Here is an Excel spreadsheet which will help you to work out the cost of your energy and water consumption. You can input your bills and meter readings and it will draw charts showing your daily and weekly consumption of WATER, GAS and ELECTRICITY. BILLS - Input your bills to calculate the volume and standing charges. READINGS - Input water, gas and electricity daily and weekly readings. CHART DAILY - This shows a graph of your daily consumption. APPLIANCES - This shows daily electricity consumption for common appliances and shows the cost of running any combination. If you want to input your own readings download this blank version which has all the meter readings removed. Its best to input daily readings for the first week so you can see how your consumption varies throughout the week and where the problem areas are. After that its usually good enough to take weekly readings. When you have taken a few readings its a good idea to do an audit of all your devices to find out which ones are wasting the most money. Work out the consumption of each device separately and add them all up. The total should match the difference between your weekly meter readings. The APPLIANCES page is useful for doing the audit. Electrical appliances always have a label showing the power rating in watts (W). To calculate the power consumption the rating is multiplied by the number of hours and divided by 1000 to get the kilowatt hours (KWH). So a 10W energy saving light bulb running for 10 hours uses 0.1 KWH. The price of electricity is about 15p per KWH so the running cost of the bulb works out at 1.5p for 10 hours. In practice it is difficult to calculate the weekly cost of running an appliance because some of them (eg. a kettle) use a lot of power but they are only switched on for a short period each day. A television or computer uses less energy than a kettle but they are switched on for much longer so the weekly running cost can be much higher. This is where an energy monitor is very useful because it can record the total KWH consumption of the device over a full week which makes it very easy to work out the weekly cost and make comparisons with other devices in your home. 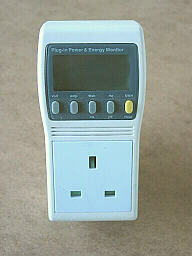 The energy monitor can also be used to measure the standby consumption which is not printed on the label.